As soon as the first images of Monsters University were released, Julie was in love with the letterman jacket that Mike and Sulley were wearing. Of course, with her history of her custom PartySaurus Rex toy and additional fun creations, she knew she was going to make a version of the jacket in her own style. She deconstructed two different hooded sweatshirts (one white, one blue) and intricately sewed them together to form the custom letterman sweatshirt shown below. The logo patch was a labor of love and involved four layers of fabric and a fair amount of detailed sewing. 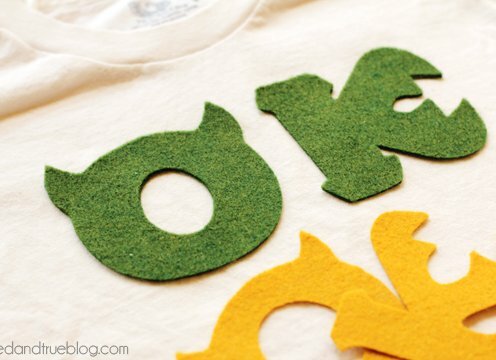 Before starting the sweatshirt, she also created a custom Oozma Kappa shirt to show her support for her favorite fraternity. She wanted more of a vintage patch-work look for the lettering, so she left the corners slightly frayed and distressed. After a few tests between the sweatshirt and the T-shirt, she couldn't be happier with the end results.